Dino-Day took over Lancaster city centre on Friday, with Rex the T-Rex roaming the streets! Face-painting, dinosaur trails and even an archaeological dig were all part of the event organised by Lancaster Business Improvement District (BID). The lifelike Tyrannosaurus Rex amused the thousands who came to celebrate, and even saw the cheeky Rex wandering in to the Marketgate butcher’s shop looking for a bite to eat. The Dukes were keen to join the dinosaur-themed occasion and featured a special screening of Jurassic Park. 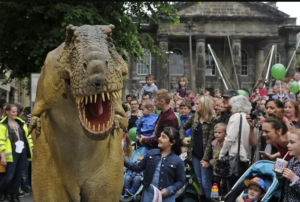 Lancaster BID Manager Rachael Wilkinson said: “Dinosaurs are set to be a huge hit this year, with dinosaur events happening throughout the country. Dinosaurs are as popular with children as they are with their parents! “With this event we are honouring the late Sir Richard Owen, 125 years since he passed away, the man who coined the word ‘Dinosaur’.